Bob Valair thinks that going above and beyond for patients is in Physical Therapist Lauren McKay's DNA. He saw firsthand the care she provided one of his loved ones after back surgery. When the time came for Bob to have a total knee replacement, he told New England Baptist Hospital staff that he wanted VNA Care to provide rehabilitation therapy in his home. The process, said Bob, was "seamless." Lauren was assigned to his care, and made her first visit the day after he returned home from the hospital. She checked his vital signs, reviewed his medications, made follow-up calls to his doctor, and reassured him that the discoloration and swelling in his leg were within the normal range. They also talked about how to manage any pain, so he could stick with the exercises that would aid his recovery and goals of returning to the golf course and driving. Lauren visited Bob three times each week and called between visits to see how he was doing. They started slowly with stairs, walking, and other exercises. He trusted Lauren to find the right balance — pushing just enough to regain his mobility while being mindful that his body was still healing. Lauren would leave thorough notes for Bob at the end of each visit. He said, "There was no doubt about what I had to do, what was going to be done, and the follow-up. The care and training that VNA Care must provide therapists really shows." As Bob progressed, Lauren integrated his stationary bike into therapy. He was eager to start driving again, so Lauren had him practice getting in and out of the car. "It was amazing how much work you needed to do to get yourself back," said Bob. Within a few weeks, Bob transitioned to outpatient therapy. Shortly after that, he started driving and taking golf lessons. Bob, pictured with Lauren, shared that he "can't say enough good things about Lauren and the care I received from VNA Care." 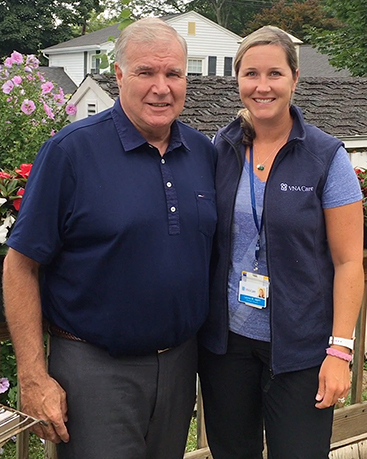 "I feel the reason I bounced back and I'm out playing golf and doing the things that I was in a timely fashion was Lauren's care and setting the right tone for what I have to do going down the road," said Bob. "VNA Care's employees go the extra mile."